Join our online community of over 16,000 climbers. Save 23%: Receive one free issue with your paid one-year subscription to Alpinist. “Why have the Piolet d'Or?” was the question Alpinist asked Christian Tromsdorf, the event's organizer. In the past the event has been criticized from climbers across the globe including the recipients of the award itself. Tromsdorf's reply was simple. Climbers should present something to the general public that embodies their values. Otherwise the public's only view of climbing will be whatever is shown on television: a thirteen year old hiking Everest; a canyoneer amputating his own arm; the seven summits tour and indoor climbing competitions. Tromsdorf's hope is for the Piolet d'Or to bring attention to the types of climbs that alpinists themselves find noteworthy. 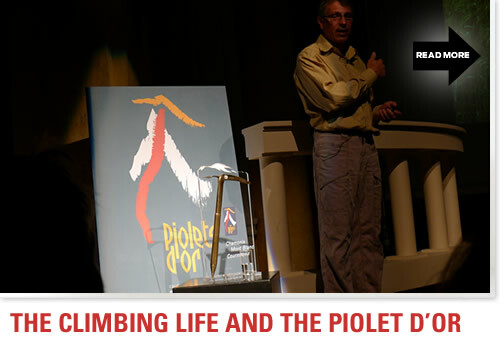 Click in to follow Alpinist's experience at the 2011 Piolet d'Or awards in Chamonix. Piolet d'Or jury president Greg Child. CiloGear craft manufactures packs for climbers in Portland, Oregon.